Fiji weddings are becoming increasingly popular and it’s not hard to see why. Consider the romantic secluded islands, spectacular beaches, friendly smiling locals and the excellent currency conversion rate – it’s simply paradise on earth. Coupled with the fact that many Fiji resorts have addressed the increasing demand of this market by introducing wedding packages, Fiji weddings are a convenient and affordable way to plan your big day. Fiji beach resorts are the most popular destinations to be married in Fiji, with many of them featuring their own onsite ceremony locations including chapels as well as function areas that can cater for your reception and wedding coordination staff who can even set up your reception right on the beach. Whether you want a traditional white wedding or are inspired by tropical Fijian ceremonies, Fiji is ready to help you realise your dream wedding. Offering a unique and memorable experience, Fiji weddings really are what dreams are made of. The friendly Fijians make it their priority to ensure your wedding is a wonderful and relaxing experience that allows you to simply enjoy the moment without stressing about the details as they take care of everything for you. The stunning locations for exchanging or renewing your vows include private islands restricted to just you and your guests, pristine white sand beaches with sparklingly clear waters, spectacular sunset decks, frangipani scented gardens and intimate chapels with amazing views. There are even life video feed facilities available, meaning friends and family back home can still witness the magic of your union. 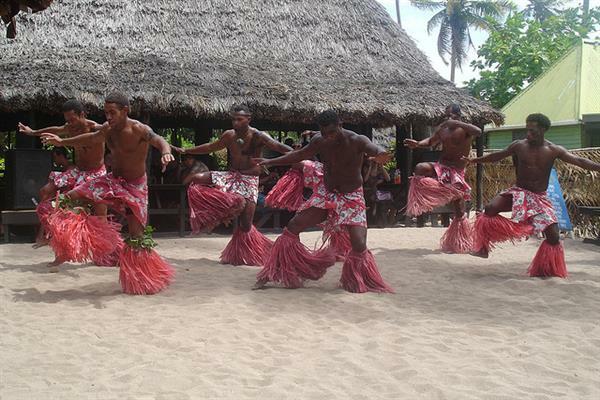 All Fiji wedding packages include the basics such as the exclusive ceremony location, a celebrant to conduct the ceremony and beautiful tropical decorations to bedeck the ceremony area, however certain packages offer added extras with a distinctly Fijian touch. From ceremonial Lali drums to the blowing of a conch shell, your Fiji wedding can be as grand as you can dream. String bands or beautiful Fijian church or village choirs provide the romantic soundtrack while the bride makes her entrance, carried by traditional Fijian warriors. What better way to introduce the new Mr and Mrs than to the sound of the ocean lapping the shore and the tender sounds of a Fijian choir. Your dream day doesn’t end once the flower petals have been thrown, with receptions available to cater to groups of all sizes. Available as a full wedding package or separately if you wish, receptions are as well planned and executed as the ceremony and offer everything from cocktails and canapés to full sit down dinners with plenty of opportunities for speeches, the bridal waltz and dancing the night away. Fiji weddings are legally binding, as long as the proper steps are taken approximately two weeks prior to your ceremony. A marriage license must be obtained by registrar verification of a valid passport, original birth certificate and divorce papers and/or death certificates if applicable. As there are no ministers in Fiji who are non-denominational, different religions require different documentation which should also be investigated and obtained prior to your arrival in Fiji. Small fees do apply to obtain a marriage license, marriage certificate and officiation however these may be included with some wedding packages. 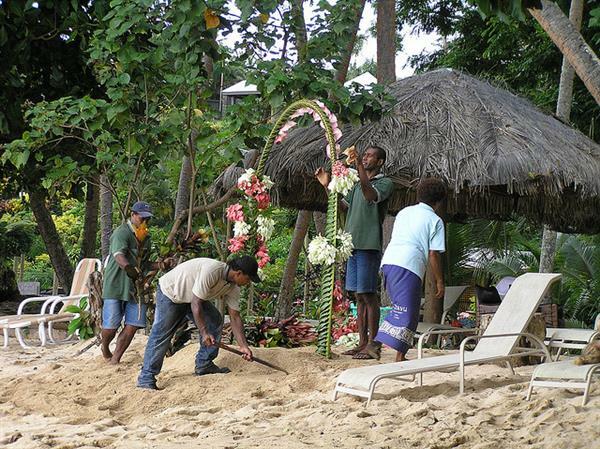 The key to realising your dream Fiji wedding is allowing the wedding coordinators to do all the groundwork on your behalf. With so many Fiji resorts offering wedding packages, choosing the right one is also really important. For a full list of Fiji beach resorts that cater for weddings and for assistance in planning and booking your dream Fiji wedding visit TravelOnline.com. About the Author: Christopher Allen Samson is an avid explorer of new cities and cultures. He contributes to several websites (including Travel Online) on topics covering travel, technology and well-being. You may follow him on his Google+.